Last year the emergent family attempted our first non-childcare summer. No day care, no sports camps. Just activities facilitated by us, the parents. It was nice to save the money but, man, a week into it we were ready for school to start again. We needed a plan. So we did this. 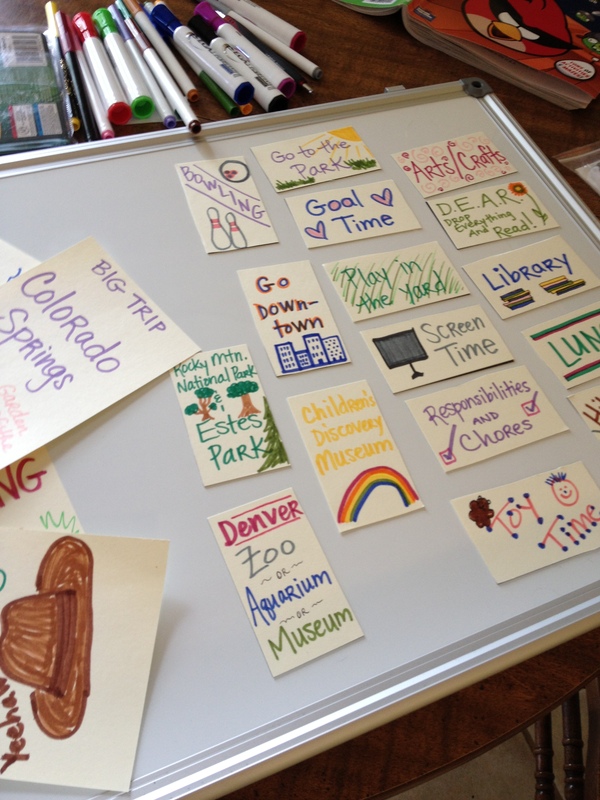 We thought of everything we liked to do, or generally needed to do, put them on magnets and rearranged them on our daily schedule as we saw fit. We’re going to add a magnet this year entitled “Math Time” or maybe something snazzier. Similar to Drop Everything and Read (D.E.A.R. ), we’re going to Drop Everything and Math (Dr.E.A.M.?). Still working on the title. 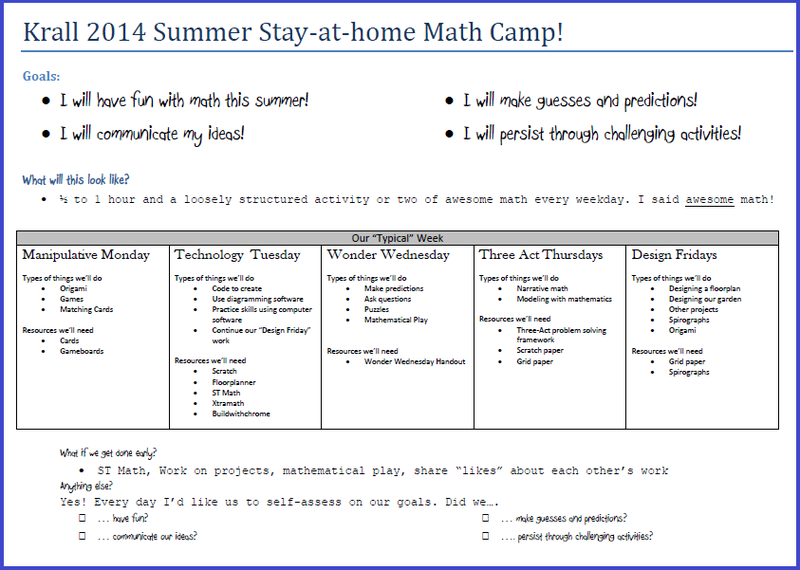 Anyway, I created a math “curriculum” for our kids this summer, based largely on the thoughtful educators who have decided to publicize their work. The curriculum is part content, part intervention, part staying-sharp. I created this curriculum for my kids, who are ages 9 and 6, entering fourth and first grades, respectively. It’s certainly subject to change, but I thought I’d go ahead and toss it up on the old blog in case it’s useful for parents or teachers who want to send their kids home with the math equivalent of a Summer reading list. I’d suggest that the curriculum is probably good for ages 5 through adults, in some form or fashion. You’ll see there’s also a heavy dose of self-reflection for the kiddos. Feel free to read more in the Introduction, where you’ll find further explanations of the tasks, some recommended viewing for non-math-educator parents, pertinent printables, and the entire 8-week calendar. Here it is, in zipped form. Please feel free to share with friends and educators if you feel it might help kids. have you tried Moebius Noodles with your children?